Weighty Matters: Are TV commercials solely responsible for screen time weight? Are TV commercials solely responsible for screen time weight? The authors analyzed the television viewing habits of 2,037 children between the ages of 0 and 12 back and the outcome they were interested in was BMI. Parents were given diaries where they tracked among other things the format of the television their children watched. 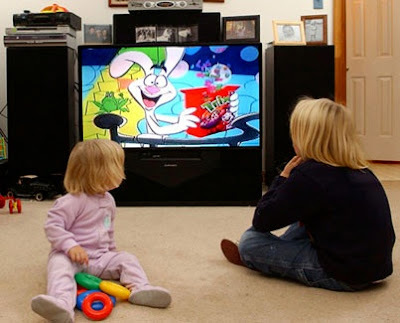 Formats could be educational viewing on broadcast or cable (shows like Sesame Street), education viewing on DVD or video (same shows as on cable but without advertisements), children's entertainment viewing on DVD or video (such as Disney movies or advertisement free television cartoons), children's entertainment viewing on broadcast or cable, and lastly general audience viewing on broadcast or cable. Researchers also divided the children into groups below the age of 7 and above as those below 7 have been shown to be unable to differentiate truth from advertising. They controlled for many variables. Physical activity, gender, age, ethnicity, sleep duration, eating in front of the television, mother's BMI, and mother's education. The results were striking. For children younger than 7 each hour of commercial viewing was associated with a 0.11 increase in BMI scores after controlling for all of the aforementioned variables. For children older than 7, when controlled for all of the aforementioned variables and also the child's baseline BMI, again commercial viewing was once again significantly associated with increased risk of obesity. The fact that the researchers controlled for so many variables and perhaps most importantly to challenging conventional dogma, physical activity, demonstrated to them that it's not what television is keeping kids away from (active play) that leads to obesity but rather that the viewing itself is causal for obesity and more specifically, the viewing of commercial advertisements. Why might that be? The authors point out that children younger than 5 see an average of 400 television commercials each year (or 30 hours worth), during Saturday morning cartoons they see an average of 1 food ad every 5 minutes, and that 95% of foods advertised on television were of poor nutritional value. Equally frightening? They point out that the average first-grade child can identify over 200 brands. So what does all this mean? It means it's probably not about how much they're watching, it's about what they're watching and while efforts to get kids off the couch to play certainly can play a role in reducing the burden of childhood obesity, it's not the playing that helps, it's getting them out of marketers' cross hairs. Given that to date there has not been a single public health intervention that has led to long term reductions in screen-time, shouldn't we instead be focusing our efforts on enacting legislation to ban television based food marketing to children in general?